Most chronic illness is generated from the gut and in particular what enters your blood stream through the intestinal lining. The type of food you eat and the lifestyle you lead also contributes to gut and disease issues. 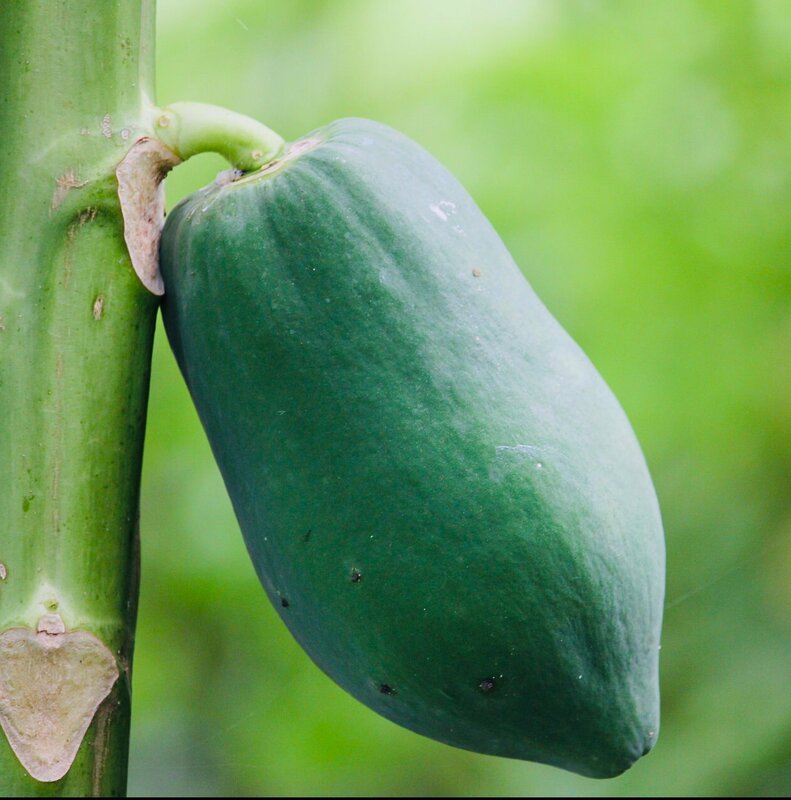 Since time immemorial the paw paw, sometimes called papaya (carica papaya), has been a crucial ingredient in natural healing, and has also been part of the staple diet of many of the planets indigenous peoples. Papain is the living enzyme within the flesh of both a green and ripe paw paw, and is renowned for its ability to break down protein. 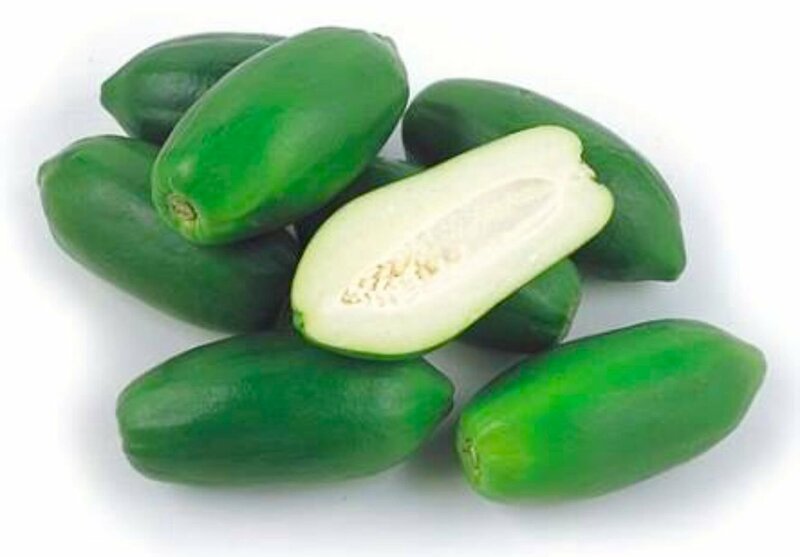 Green papaya (unripe) contains high levels of papain and low levels of naturally occurring fructose. Unlike ripe, which is the complete reverse - higher levels of fructose and lower levels of papain. There are some amazing stories about the wonders of the paw paw, but I will preface what I am about to share with you with the following words of caution; in this day and age it is still important to consult a medical practitioner to determine any health issues and to listen to what options they might have to offer. From a scientific perspective paw paw contains acetogenins which modulate the production of ATP or adenosine triphosphate in mitochondria of cancer cells. The enzyme in the paw paw is also referred to as a ‘protein eater’ because that’s exactly what it does, as well as seek out ‘high energy’ users within the cellular environment. An example of these types of cells are cancer cells, which use high levels of energy to stay alive. If you are fit and well, your digestive system is working properly, and you have no diagnosed cancerous condition, then processed (extract or dried) forms of the fruit are ok to use to maintain optimum gut health. Remember, papain loves to eat up protein forms like parasites and bacteria and has been shown to be highly effective in removing parasites from the intestinal tract. Still after more than 12 years since a NDE (Near Death Experience) with reflux, I still take green papaya powder daily after my main meal. (1 flat teaspoon in water straight after eating so the enzyme can get to work on the proteins in your food and this includes all proteins in plants and vegetables). For much of my life I had trouble with a hiatal hernia and suffered from near fatal chronic reflux. I don’t anymore because my gut – my warp core of my personal Starship – is processing proteins more efficiently than before and has developed a certain ‘operational efficiency’ per se. When I don’t need to take it, especially as I have virtually cut ALL heavy proteins from my diet (red meat, pork and heavy cheeses in particular, milk and flour based products) then my gut feels good with no bloating, belching or flatulence. Based on my years of consulting as a Certified Holistic Health Counselor, I can confidently say that much of the global population suffers from a gut issue characterised by reflux, heartburn, indigestion, bloating or digestive discomfort. 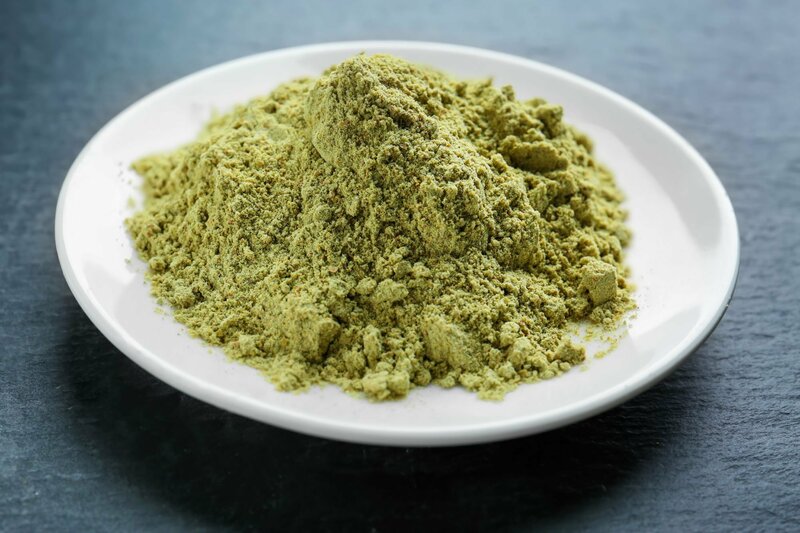 For me the response to taking green papaya powder was almost instant; after more than 45-years of suffering from digestive dysfunction I felt relief. It got better every night from there on and after a few months my gut was almost back to normal. It took 18 months to 2 years to be completely heal of a myriad of issues. Now I take regular doses of papain, usually through my green papaya powder with water added. For much of my life I had trouble with the hiatal hernia and suffered from the chronic reflux. My general level of health along with energy levels increased dramatically. Now in my mid sixties I can proudly say that I have no need for any form of medication. As a male my prostate operates perfectly, I have no signs of diabetes or cardiac problems. My head remains clear each day and I can cope with the stresses of life with greater ease. I am 100% mobile with NO aches or pains. Complimenting the 1 flat teaspoon of powder I take daily after my main meal I have also removed ALL meat, animal products including ALL dairy, gluten (wheat) products, grains, processed food, white sugar and white rice (it turns to sugars in my gut). There is no-doubt that inflammatory foods cause long term issues. 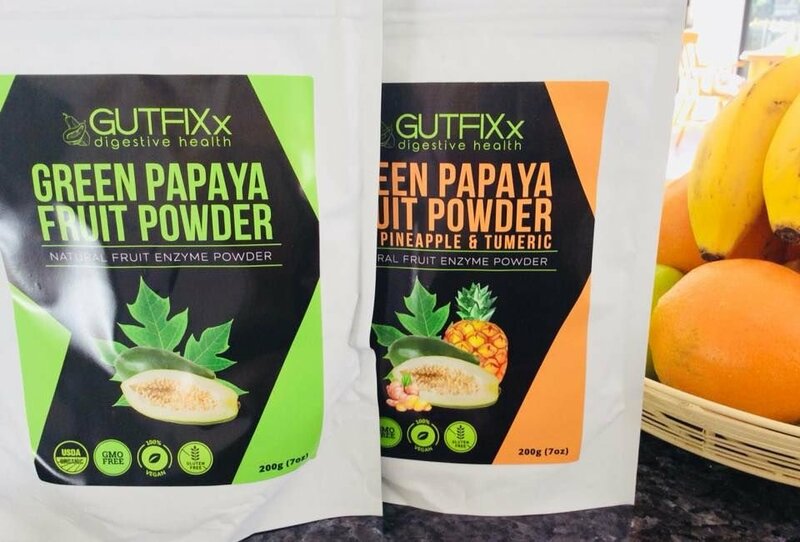 The green papaya powder and the green papaya powder, pineapple and turmeric powder we produce are food based and part of a functional, natural approach to life. Get some Green Papaya now and see the difference for yourself. ➡️➡️ BUY GREEN PAPAYA POWDER OR CAPSULES. We ship all orders in Australia and Worldwide sameday. I would like to share some links with you talking more about the benefits of papaya powder. Have a look and make up your own mind about how you’d like to approach your own healing, but remember to please canvas all options with your health professional. Life is about making choices; none of them are better or worse, they are just choices. I found choices tend to present themselves when knowledge about a given matter is present. Everyone is different and what may work for one may not work for another. Call it ‘gut feeling’, then go with it whether its allopathic medicine with a pharmaceutical treatment or another option like my dried green papaya powder or leaf tea. The choice is yours and yours alone. You can purchase some now from our online shop..